We'll start with Kentucky, which is looking more and more like the championship contender we expected it to be coming into the season. The Wildcats are up to No. 12 after beating Texas A&M and Vanderbilt handily. 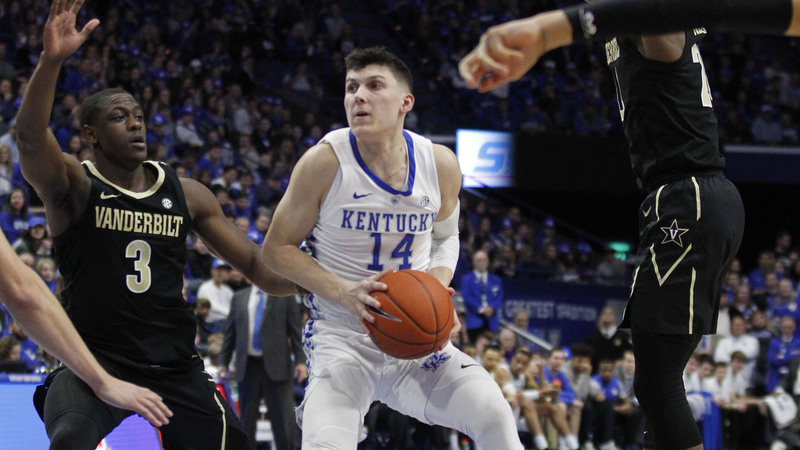 One reason why Kentucky jumped six spots is because plenty of schools ranked in the teens last week struggled. But UK has been good lately, save for a tight road loss at Alabama. The defense has improved drastically. Kentucky was ranked in the 50s in defensive efficiency at KenPom after a loss to Seton Hall in December, but it's vaulted all the way up to No. 22 in less than a month. Quade Green is a nice player, but his decision to transfer has helped the Wildcats' role allocation. Ashton Hagans has developed into a sturdy two-way player after a rocky start to the season. Keldon Johnson continues to shine. P.J. Washington and Reid Travis looked like a clunky fit at the start of the year, but they're figuring each other out. Tennessee is still the team to beat in the SEC. But Kentucky will give the Volunteers a run. That Feb. 16. matchup can't come soon enough. The Big Ten went a little nuts this week, which is part of the reason why the bottom half of the poll looks so much different. Ohio State has lost three straight games, Wisconsin has faded after a rollicking start, and Nebraska has cooled off. This doesn't necessarily reflect negatively on the Big Ten. These teams all ran through their nonconference schedules, and we're seeing that almost every school in league is capable of notching a quality win on a given night. But, we're finding out that Michigan and Michigan State are in a tier above the rest of the conference. A team like Wisconsin can beat either of them in a 40-minute game, but the Wolverines and the Spartans will battle it out for the conference crown. Beyond that duo, the league is chaos. That chaos opened the door for some new schools to slide into the top 20. A few we'll highlight: No. 15 Marquette and No. 18 Ole Miss. Markus Howard would be a legitimate Naismith candidate most years, but this season's race is as stacked as any. He dropped 53 on Creighton and the Golden Eagles are now 14-3 with a 3-1 Big East record. They're the highest-ranked team in the conference. Aside from Howard, balance has been key for Marquette. It hasn't been that way in recent years. The Golden Eagles finished 12th in offense and 182nd in defense in 2017-18; they're 38th and 40th in those departments this season, respectively. Theo John has been a revelation for the defense. You'd like to see some scorers emerge to complement Howard, but Marquette is good enough to win the Big East. Villanova is coming (which we'll touch on soon) but Howard plus good defense is a solid winning formula. And what a story Ole Miss has been. The Rebels were picked to finish last in the preseason SEC poll, but are 13-2 and undefeated in conference play. Ole Miss has won nine in a row including back-to-back wins over Auburn and Mississippi State. Kermit Davis has his team playing a pretty style of basketball. The Rebels are ranked 10th in effective field goal percentage and make 38.2 percent of their 3s. They don't have a superstar, but they move the ball well and don't have a weak link on offense (which is an underrated component of offense. Sometimes it's better to have five decent players than three good ones and two total non-factors). Ole Miss went 12-20 last season. There's reason to be excited about hoops in Oxford once again. A few other tidbits: Villanova is ranked 22nd and is off to a 4-0 Big East start. The Wildcats are up to No. 11 in offensive efficiency. Marquette has been awesome, but it's hard to pick against Villanova in that league until someone else wins it. Maryland is ranked 19th after beating Minnesota and Indiana this week. It feels like there's going to be a revolving door of Big Ten schools in that range of the poll all season long. On that note, there's a clear difference between the top 10 teams and, well... everyone else. Someone in the top 10 will probably lose this week. But they're just more consistent on a night-to-night basis than the rest of the country, and it's a reason why the top of the AP Poll has remained more stagnant than most years. Duke, Michigan, Tennessee and Virginia are all no-brainer title contenders. In a sport where there's so much variance, they deserve tons of credit. There are some big games to look forward to this week. Here's to some more dramatic endings and miraculous performances.